The Line 3 saga is almost over, sort of. Three men and two women, working in their downtown St. Paul government building, are about to open a new chapter in nearly four years of debate over Enbridge Energy's controversial oil pipeline replacement project in Minnesota. The company wants to replace its aging Line 3 oil pipeline along a new route in northern Minnesota, a plan that has drawn fierce opposition from environmental groups, climate change activists and tribal groups. This pipeline proposal has come to symbolize the societal fight between our reliance on oil and the benefits it brings versus its climate and environmental risks. This week, the Minnesota Public Utilities Commission will hear one final round of oral arguments from supporters and detractors of the proposal to replace Line 3. Next week, the commissioners are expected to decide whether to give Enbridge their blessing to move ahead with the new pipeline. Here's a look at what's ahead this month, and what could come after the commissioners' decision. What is the commission supposed to decide? Commissioners will decide on whether to grant Enbridge two approvals it needs to build Line 3: A certificate of need and a route permit. Each approval has its own chapter in Minnesota statutes. Enbridge is required to have a certificate of need to build any new pipeline. As for the route permit, the commissioners could allow Enbridge to build along its preferred, rerouted path; build the replacement pipeline along the current Line 3 route; or suggest something else entirely. What's the timeline of this part of the process? During the oral arguments, individuals will get 10 minutes to speak. The general public isn't allowed to testify; only designated intervenors who have been granted official party status may speak. It's likely that decisions on the route permit and certificate of need will come Wednesday, June 27 or Thursday, June 28. But commissioners could decide on either at any time during the process. How it happens is in the heads of the five commissioners. The Public Utilities Commission is chaired by Nancy Lange, a Democrat, who is joined by vice-chair Dan Lipschultz, a Democrat; Matt Schuerger, who has no listed party affiliation; John Tuma, a Republican; and Katie Sieben, a Democrat. Commissioners serve six-year, staggered terms. The governor appoints commissioners and picks the chairperson. Being a commissioner is a full-time job. The commission is headquartered in an office in downtown St. Paul. State law requires that no more than three commissioners be from the same political party, and at least one must live outside the seven-county Twin Cities metro area when they're appointed. "Commissioners must be persons learned in the law, engineering, public accounting, property and utility valuation, finance, physical or natural sciences, production agriculture or natural resources as well as being representative of the general public. Commissioners shall not be swayed by partisan interests, public clamor, or fear of criticism. How might the PUC rule? 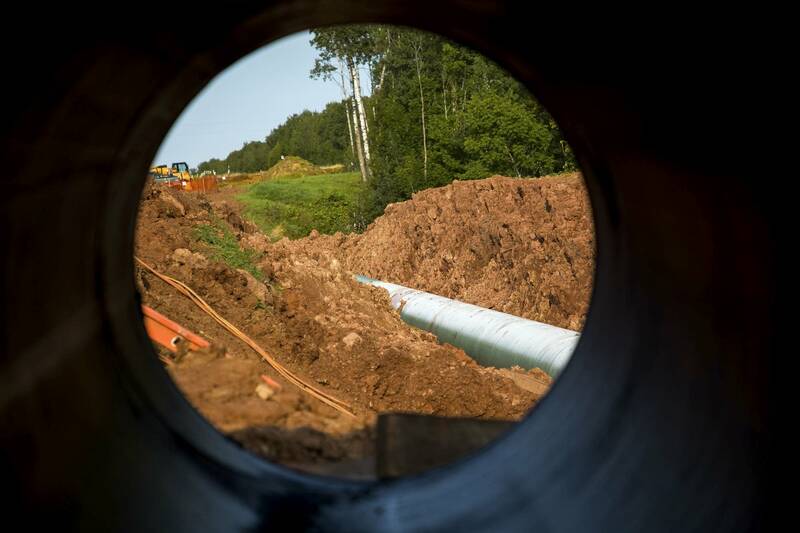 Public Utilities Commission staff have outlined the various decision options for the five-member commission, which has the final say in whether to grant Enbridge approval to replace its aging Line 3 pipeline with a new one along a different route. This option would be Enbridge's preference. It would allow the company to transport 760,000 barrels per day of crude oil across the U.S. border with Canada and across Minnesota to Superior, Wis. This is where things get complicated. PUC staff have listed 12 different conditions commissioners could place on a Certificate of Need for Enbridge. For example, the PUC could require Enbridge to remove the old Line 3 pipeline, rather than leaving it in the ground. Other possible conditions include limiting the diameter of the pipeline, requiring renewable energy offsets and adding insurance requirements. Some of the conditions could significantly increase the cost of the project. The commission could reject Enbridge's project if it feels there's not enough evidence that the company's Minnesota customers need additional oil pipeline capacity. The Minnesota Department of Commerce has questioned Enbridge's oil demand calculations. Lawyers in the case say this option is unlikely, but it is possible the Public Utilities Commission will find some unforeseen reason not to rule on the Line 3 case, as scheduled. What happens after the PUC decision? It's tough to say what will happen without knowing what the commissioners decide, but one scenario is certain. If Enbridge gets approval to build its new Line 3, opponents of the project have promised they'll protest. Some people have already been setting up camps to prepare for anti-pipeline demonstrations. No matter what the commission decides, some groups will be upset, and legal action will likely follow. Consider the example of the Keystone XL pipeline: The proposal to build the project was followed by years of protest; President Obama halted the project in 2015; President Trump approved the project in March; and there's still a battle over whether it gets government approval in Nebraska, its proposed endpoint. The Public Utilities Commission will live stream video of the proceedings on its website. MPR News will also be covering the PUC hearings and deliberations on the air and online throughout the hearings. And, to better understand the big picture of pipelines across the country, subscribe to our new podcast, Rivers of Oil, which documents the Line 3 story and looks at the ways oil pipelines have come to the forefront in the clash between society's reliance on oil and the risks that oil brings along with it. Follow us on Twitter for frequent updates: @MPRnews and @RiversOfOilMPR.